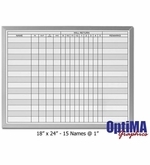 Opti-Print magnetic personnel in / out boards. 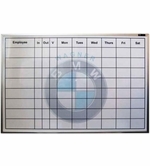 Keep track of employees and where they are. Know who is in and out and what date and or time they are returning. 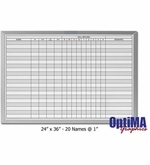 These are really nice, American made, magnetic receptive in/out planners that track from 15 to 32 employees. 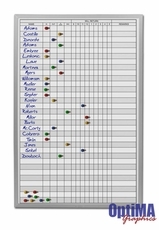 Complete kits include red and black damp erase markers and assorted colored push pin magnetic indicators. Aluminum trimmed, magnetic boards created with our exclusive Opti-Print writing surface ensures years of trouble free use. The boards have easy to read column headings: Name | In | Out | In Conf (In Conference) | Vac (On Vacation) | Will Return in one hour increments from 9 to 5 | Remarks to write in what time or what date they will be back. The rows are easier to follow with our planners too because the lines are variegated between white and light gray. Normal lead-time is about 3-5 working days and all units ship by UPS.